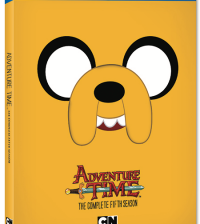 This week, on October 7, season four of Cartoon Network’s “Adventure Time” released on Blu-ray and DVD. The release features all 26 episodes from the season and some pretty awesome bonus material. Marceline the Vampire has always been a favorite character of mine (mostly cause she is adorable and folksy but also slightly evil). So, I loved that the season four DVD and Blu-ray case is designed with her face much like previous releases focused on one character. Season four has some of the best episodes we have seen so far. 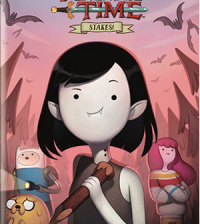 We not only get to see the introduction of the Flame Princess but also Finn and Jake’s trip to the Nightosphere. One of my favorite episode’s had to be “Card Wars.” It is accurate and hilarious. The Ice King is up to hijinks with his creation of his own princess after stealing his favorite parts of all the princesses in the land and it gets weird. But not all the episodes are weird and odd. “I Remember You” was sweet and endearing. We see the man who Ice King used to be and I won’t lie it almost brought tears to my eyes. The song and moment that is “Remember You” is one of the best moments in the entire series. 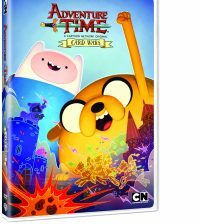 One of the best things about getting season four on DVD or Blu-ray is the 19 minute featurette “Distant Bands: The Music of Adventure Time.” It has series creator Pendleton Ward, creative director Pat McHale, and storyboard artists Jesse Moynihan and Rebecca Sugar offering their commentary on the important role music plays in the series. One of the things that immediately first drew me into the series was how surprisingly good the original music actually is. All the songs from Marceline the Vampire are SO folksy and cute and just good. I mean even the theme song is super catchy. I loved seeing the background to each of the different songs and how important the writers felt they were to the show. Overall, I feel like season four is such a high point for “Adventure Time” that I can’t sing its praises enough. It is only going to get better. I literally watched all 26 episodes in a row in a binge-watching session and still love it. Owning season four is a must have and it will be a GREAT gift for the upcoming holiday season. Trust me!